PROVIDENCE, R.I. - The second-seeded Providence College men's hockey team was edged by seventh-seeded Boston College, 2-1, in Game 3 of the Hockey East Quarterfinals on Sunday night at Schneider Arena. The Eagles claim the best-of-three series, 2-1, to advance to next weekend's semifinals at TD Garden. - The first period included two power play opportunities for Providence and one for the Eagles, neither team could find the back of the net to end the first period, 0-0. Scott Conway headed to the penalty box just 1:58 into the game after a face-off violation. 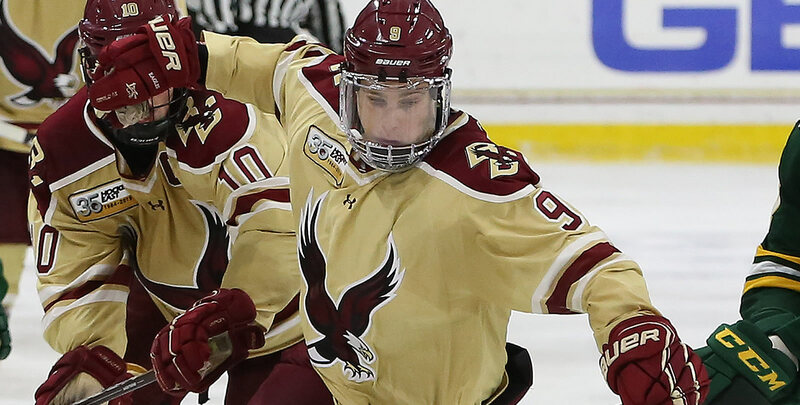 Hayden Hawkey stood his ground as he faced four shots on net against Boston College's one-man advantage. - Providence earned their first power play chance of the night when Casey Fitzgerald was called for charging, 5:48 into the period, Oliver Wahlstrom ended the period being penalized for slashing with 1:07 left in the period. The Friars failed to create many opportunities, recording two shots on net through both power play opportunities. Tyce Thompson hit the crossbar with under 15 seconds remaining in the period on a wrist shot to head to the second period. - Michael Kim put the Eagles in front with a man advantage, 8:22 into the middle stanza. Casey Fitzgerald cut off an attempted clear by Providence before delivering a pass to Kim at the top of the left circle, Kim settled and finished with a wrist shot over Hayden Hawkey's glove through traffic. - Boston College led 1-0 after the second period. Providence outshot Boston College 11-9 in the period and 21-19 through two periods of play. - Scott Conway buried his 14th goal of the season to even the game at one goal apiece, 6:58 into the third period. Josh Wilkins took a slap shot from the top of the right circle that caromed off Woll's pad, Conway one-timed the rebound in front. - The Eagles scored the eventual game-winner 11:55 into the third period for the first goal at even strength in the game. Logan Hutsko slipped down the right boards before ripping a wrist shot over Hawkey's right pad. - Providence dropped to 2-4-0 against Boston College this season. - Scott Conway notched his 99th career point in the third period. 1-1 (PC) - 6:58/3rd - PP - Scott Conway (Wilkins, Mirageas) - One-timer in front of the net beating Woll stick side off a rebound. 2-1 (BC) - 11:55/3rd - EV - Logan Hutsko (Fitzgerald, Mattila) - Wrist shot from the edge of the right circle beating Hawkey over his right pad. The Friars will await their NCAA Tournament fate pending the outcomes of next weekend's games across college hockey.